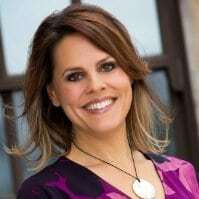 Chief Marketer recently chatted with Alyson Griffin, Intel’s vice president of global marketing strategy, to discuss how the tech titan is engaging B2B prospects and customers with live events, VR and more. CM: What are the biggest B2B marketing challenges for Intel? GRIFFIN: The world at large knows Intel Inside. The world knows us as a chip inside a PC, and that’s fantastic but we’re not just that. The future growth of the company is on the B2B side but people don’t know us that way. Ninety-eight percent of the public cloud is on Intel. We want to make sure customers understand that their aging infrastructure won’t keep pace with what they want to do going forward, and we want to make sure they pull through a solution that lives on Intel infrastructure, and encourage developers to develop on our platform. CM: Are Millennials having an impact on how Intel markets? GRIFFIN: The oldest Millennials are 34, and they are now tech decision makers. In the early 1990s, all we had to do was send out press releases to the IT guys and we were done. Now, the IT guys are still important to us, but the big technology decisions are now made by the c-suite. CM: What does Intel want to communicate to the c-suite? GRIFFIN: When I worked at an original equipment manufacturer (OEM), I was selling an actual device. At Intel, we sell an ingredient that goes in so many different things, so we can be a trusted third-party advisor, because we’re not necessarily directly selling [to the end user]. It gives us an interesting view point. We realized that we need to get our name out there with the people who are making the decisions and make them realize we can enable efficiencies going forward. CM: What can B2B marketers learn from B2C? GRIFFIN: I’ve worked in both B2B and B2C. On the consumer side, we were always getting the tech into the consumers’ hands so they’d understand it and play with it. We need to do that in B2B—they’re people too, and they still like to have fun. The B2B marketing industry can be so dry, and we don’t hook anybody with the coolness of the technology. CM: What has Intel done to engage B2B audiences with technology? Intel technology helps power drones that let researchers gather data on whales. GRIFFIN: Events are so important. About 10-to-12 percent of our marketing budget is devoted to experiential. You can have a captive audience. We held a big event for the data group at SXSW last year, with a lounge [focused on] artificial intelligence. The data group hadn’t attended the show before and we hadn’t gone after that demographic. We did interesting demos around AI and drones, showing things like how we were collecting data in the oceans on humpback whale colonies and studying algorithms on their health, showing how whales are “fingerprinted” with a “snotbot.” [After the event], follow-up campaigns focused on the topic and showed practical uses of AI. [More recently], we gathered 100 c-suite executives for a full day in New York at the Skylight Modern to talk about all the technology that businesses have to think about with the tsunami of connected devices out there. We showed how drones are helping a wine maker with production and crops, and had a VR experience around Major League Baseball, showing how we’re changing that experience. Eight hundred people were registered, and we had conversations with field partners and customers. B2B is a new marketing muscle in general for Intel, and we need to be at events and standout—rather than just having someone standing in front of a screen, we can tell stories with a VR headset. 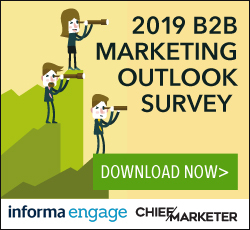 CHIEF MARKETER: Overall, in what areas can B2B marketers improve? ALYSON GRIFFIN: Marketers have to be smarter about gaining insights from their campaigns. You need to be able to understand the consumption of the assets you’ve created. Was a video watched the full way through? What did a target do next? Did they download a whitepaper or whatever? Those types of things weren’t known in the past. Marketers have to be smarter about putting tech into place to deliver the next asset automatically, and technology can help marketers understand insights to extend their reach, she says.